We never had “silent nights” during Christmas at my grandparents’ house in South Hadley , Mass. Gagnons always celebrate large and loud—just like our French Canadian family. Lights blazed in every room (occupied or not). The Christmas tree sparkled in front of the picture window with its view of snow-covered Mt. Tom beyond. One fateful Christmas night, someone cranked up the hi-fi stereo until it blasted out Christmas tunes. Then a helpful someone turned on the dishwasher. We were plunged into darkness and silence. Grandpa Armand ranted and went to find some fuses. Someone else rummaged for candles, and soon a soft glow filled the living room. Then we began to sing Christmas carols. The house grew warmer as we sang. Everyone took a turn to lead a song and hold the special candle. My grandfather and one of my uncles worked on the fuses, but the delay didn’t concern the singers. Without a lit tree and without recorded music, the spirit of the season united us. One photo remains from that night. My great-grandmother Pearl Majeau-Gagnon-Ringuette-Misek had buried three husbands in her lifetime, yet she still found it a merry Christmas. She held the candlestick in one hand, the other hand raised in song. Her mouth formed an “O” as she sang. We were disappointed when the lights came back on. Death, divorce, and distance have touched our family through the years. The old house on Parkview Drive was sold in the 80s. Time spread us farther apart, from Massachusetts , to Texas and California and other states in between. We’ve never been together that way since, but I will always hold the memories of Christmas ’77 on Parkview Drive close to my heart. Electric lights and extra trimmings and digital music don’t make Christmas special. Take those away and what do you have? 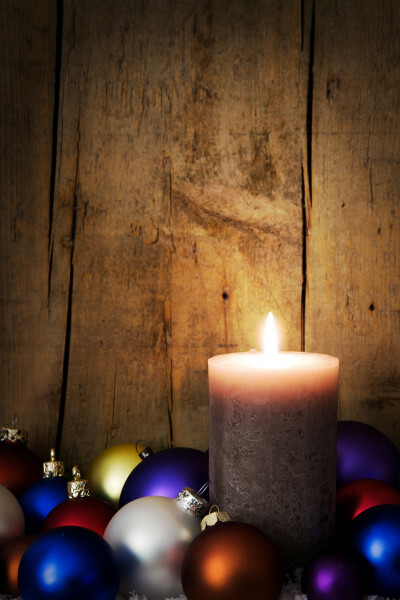 The silence of candle glow, the simplicity of voices singing age-old carols. An imperfect family, celebrating the joy of the season in a perfect way. I’m married with my own family now. Each Christmas Eve we light a candle and fill the house with friends. We celebrate the Light that came into the world long ago. We make memories that will not fade, just like the Christmas when the lights went out. Merry Christmas to you, and here’s to a great 2016! What a beautiful memory that sparked your own family tradition. Sometimes losing power is a blessing in disguise. Lynnette–What a great memory and story you have to tell your children. :) Thank you for sharing your Christmas with us. Lynette, thanks for sharing that special memory. Merry Christmas. What a wonderful memory! Thanks for sharing. Merry Christmas! I love Christmas memories. Lately, I have been asked several times to name my favorite Christmas memory. I always have an answer, but, in thinking about those special memories, I begin to remember more and more special times. One favorite memory is my Daddy decorating the bushes in front of our home. Lots of beautiful, bright colors lit up the bushes. I remember climbing in a chair to look outside at night and seeing those beautiful, glowing lights. Ahh….. another precious memory. Beautiful essay, Lynette. I love the image of passing a candle around and starting a new song. You should use it in a Christmas novella! Sometimes being a child helps us see things from the right perspective, you know? I laughed when you said your grandpa started ranting. That’s what we adults do, you know? Things didn’t go right! Or as planned. But from the viewpoint of a child everything’s just fine. This was a great reminder for me in what’s been a crazy busy season of life. Thanks for sharing, Lynette. What a lovely Christmas memory Lynette! That would be a magical night and I love the idea of passing the candle around & whoever gets it starts a new song :-) Thanks for sharing with us. Have a blessed Merry Christmas!